Authorities say an elaborate pot-growing operation has been discovered flourishing on forest preserve land northwest of Chicago. Local police and federal agents Tuesday chopped down and burned thousands of marijuana plants found growing at the Crabtree Nature Center Forest Preserve near suburban Barrington. 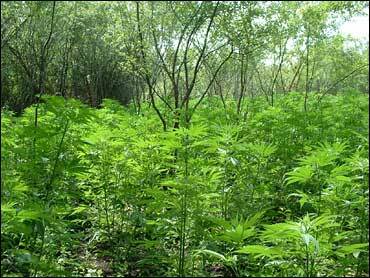 Authorities say over 38,000 marijuana plants were removed from 14 different fields within the nature preserve. The plants have an estimated street value of $5 to $10 million, according to Gary Olenkiewicz, special agent in charge for the federal Drug Enforcement Agency Chicago Field Division. Richard Waszak, Cook County Forest Preserve police chief, called the illegal farm "the most sophisticated operation that we've seen." Waszak said contraband crop was discovered when an intern doing research in the 1,600-acre park found men tending to an irrigation system and contacted forest preserve police. Investigators say that in addition to the marijuana fields, they also found camps with tents, cots and supplies, including food, a cooking area, shower area, and fertilizer bags. They say one of the encampments has a reinforced underground bunker, lined with four-inch logs and covered with dirt. During an inspection of one of the cultivated fields, investigators found two men wearing camouflage clothing and sleeping in a tent located in a heavily brush-covered area in the center of yet another cultivated field of marijuana. Authorities say Bernardo Rangel, a Mexican citizen who has a permanent resident card, and Jose Verra, an undocumented immigrant from Mexico, face charges of cultivating marijuana, criminal damage to land and criminal trespass. The two men have been charged in connection with the growing operation, but authorities say neither suspect is believed to be the mastermind. For the Chicago area, this is the fourth marijuana eradication in the Cook County Forest Preserves to take place during 2007. The total marijuana plants eradicated and destroyed in this year's previous operations totaled approximately 17,000 plants and, at over 38,000 plants, Tuesday's raid clearly surpassed that number. "This particular marijuana operation shows the sophistication of some traffickers," said Mr. Olenkiewicz. "Instead of smuggling marijuana across the border, this drug organization set up shop in the United States on public property, in the forest preserves, where it was being cultivated for harvest and illegal distribution."